I had a good few sessions today glassing the deck. 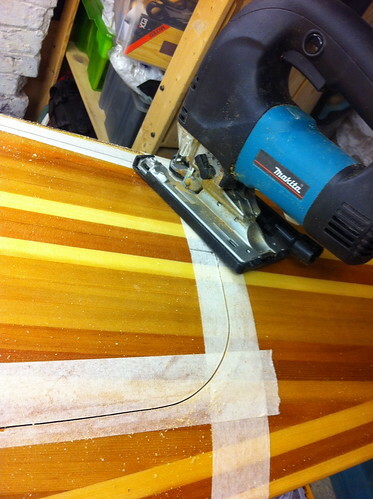 The idea was to leave as short a time as possible between thin coats, and avoid amine bloom and orange peel. 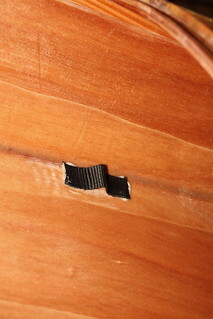 I took Navin's tip, and masked below the sheerline, which worked very well - thanks! 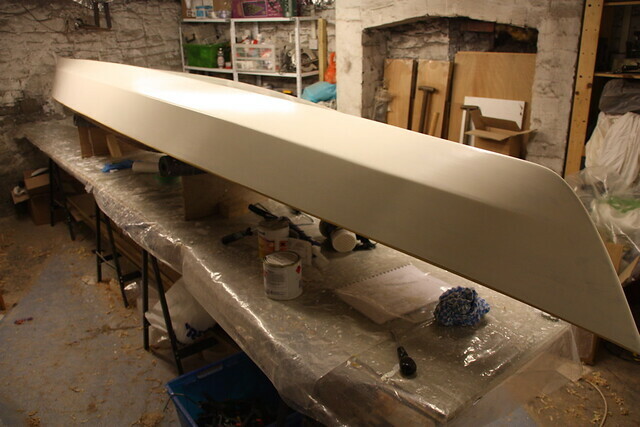 Then the coaming went on, with plenty of clamps, followed by two more coats with a roller and foam brush. The next stage is rather committing - taking a dirty great saw to my lovely deck. 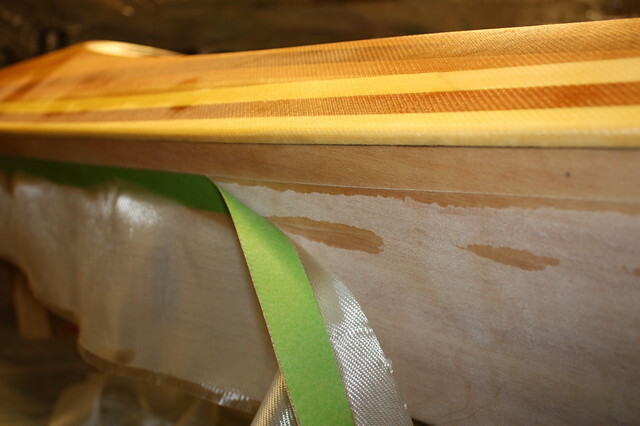 A downward cutting laminate blade gave me a nice smooth finish on the top face, so all good. The masking tape makes it easier to see the lines. Matching holes fore and aft. 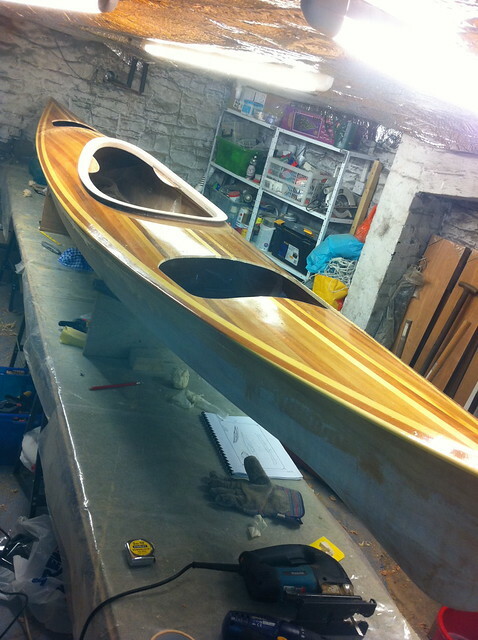 I need to get the boat to a launchable state for a long-booked trip to Windermere next weekend, and I'm away next week arrgh. 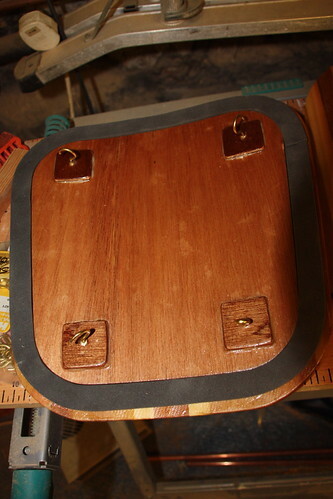 I'm leaving the hip braces till later, and I'll do the varnish later on as well. Back to back sanding and painting the hull this weekend. The whole house smells of PreKote at the moment! The hatches will have internal bungees. Three brass cup hooks and one eye (so I don't lose loose hatches) will catch the bungees, which will be tied to tape loops glued inside the hull. I've experimented with various loops to provide a finger lift. Starting out with two blind holes, shock cord epoxied in looked good, but as expected deformed and pulled out under load. Static cord stays in, but I can't get it neat - I get epoxy on the surface, and then it soaks into the cord, leaving a gap. 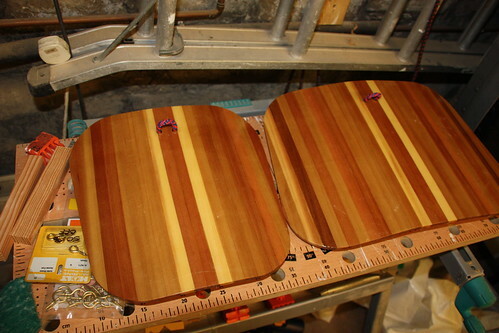 For the final finish, I'll cut these out, and go for 6mm black cord through the deck, sealed with clear silicone. 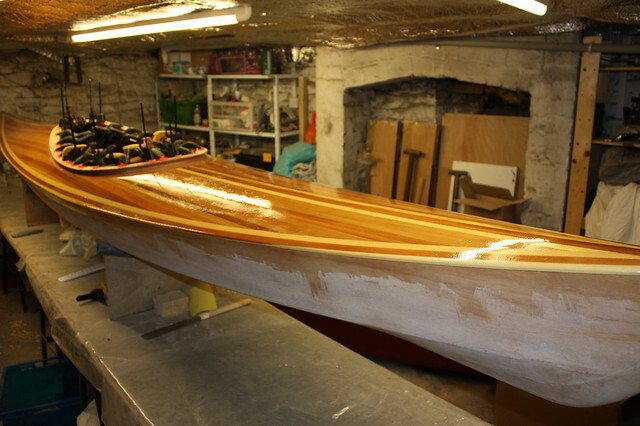 Then I finished off the hull sanding. I put two coats of PreKote on, and sanded most of it off again. This is 50/50 with Toplac. I hope to get a couple more Toplac on tomorrow, and that will be pretty much it before the water (unless of course it tips it down, in which case I'll carry on). Good job, it looks fantastic. They paddle really well and hope you have a great one at the weekend.